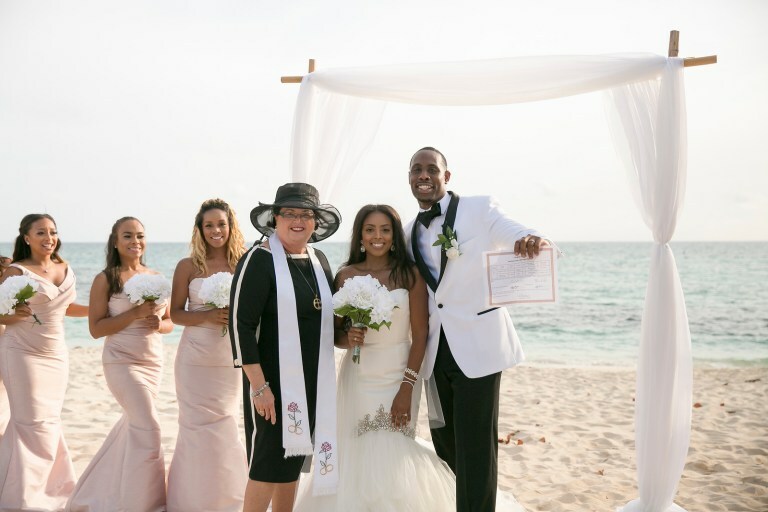 From last minute wedding nerves, to grooms that strip off post ceremony for a skinny dip, you could say that Joy Basdeo, one of Cayman’s most popular wedding registrars, has seen it all. Now Joy has celebrated a milestone in her career. On Saturday, May 6, Joy conducted her 2,000th wedding ceremony at the Kimpton Sea Fire Resort + Spa. Shakiera Ebanks Lawson and Frank Dillard from Phoenix, Arizona, became Mr and Mrs when they tied the knot at the prestigious resort in a ceremony that the veteran registrar called “lovely and beautiful”. Indeed, Joy said she was delighted to share the spotlight for the milestone event with the lovely couple and their large extended family and friends. Joy is a familiar face with many residents in Cayman, having married thousands of local residents during her illustrious career. A family business, Joy’s mother, Francine Jackson, was Cayman’s first civil registrar of marriages. The family affair started in 1985 when Joy’s father, Vernon Jackson, retired from the civil service and was asked by the governor at the time to become a marriage officer. Joy fell into the family business, when in 1995 her mother made her her deputy, meaning she could do weddings whenever her mother was away or otherwise unable to officiate. It was a role she filled for some 13 years. Basdeo retired from the civil service 12 years ago and after a couple of years of enjoying her retirement, started helping her mother out, then in her 70s, in her office in West Bay. Joy said it was then that she realised that there was a gap in the market. “In May 2008 I opened my Simply Weddings office at 305 North Church Street as a sister company to Cayman Weddings and catering to cruise weddings. However, before long the company was doing just as many local weddings as overseas weddings,” Joy said. To keep up with demand, Joy moved her office to its present location along the George Town waterfront, where the business has continued to go from strength-to-strength. Continuing the family tradition, Joy’s husband Sam joined Simply Weddings six years ago. “I have built on the business model my parents used successfully for 30 years, which is to provide a service which is simple, elegant and personalised,” Joy said. These days Joy conducts more than 300 wedding ceremonies every year. Looking back over her illustrious career, Joy has a few tales to tell. She said one of her most memorable weddings was in 2011, when only the bride turned up after the groom refused to get off the cruise ship. Joy added that no matter how many marriage ceremonies she conducts, she always aims to make everyone feel like family. “My mother always told me that was the key, that on such a special day in a couple’s life, to surround them with love, with caring, and really, often to be stand in parents,” Joy said. It’s a principle that no doubt will see Joy reach another milestone figure in the not too distant future – matching her father’s 4,500 ceremonies.